Zadejte termín pobytu a vyberte si z 229 hotelů a dalších ubytování. Set in Paramaribo, 1.7 km from Paramaribo Central Market, Q-Inn Boutique Hotel features free WiFi access and free private parking. Guests can enjoy some cocktails in the on-site bar with a terrace. Offering an outdoor swimming pool and a restaurant, Holland Lodge Paramaribo is located in Paramaribo. Free WiFi access and free private parking are available. Employees and owners are very friendly and considered. Ramada Paramaribo Princess offers an Entertainment Center, the famous rooftop in Suriname, a Japanese restaurant and free WiFi access. High comfort and hospitality in the heart of Paramaribo. First class breakfast and delicious dinner. Helpful and well organized staff. Wonderful pool on the top of the roof. Everything was fine. Thank you for all the great days and nights. Located in the city centre, Hotel Palacio offers free WiFi and buffet breakfast in Paramaribo. The central market, Independencia square, and Zeelandia Fort are 200 metres away. Hotel Courtyard Paramaribo se nachází jen 10 minut chůze od zahrady palem a nabízí ubytování v pokojích s kabelovou TV, terasu, bazén a fitness centrum. Je zde také restaurace a bar u bazénu. high end comfort hotel. Excellent facilities. Good pool and small river-side beach. Set less than 1 km from Paramaribo Central Market, La Petite Maison in Paramaribo features a terrace. The property is located a 4-minute walk from Waterkant, less than 1 km from St.
Elegance Hotel & Casino is situated in Paramaribo. Featuring a 24-hour front desk, this property also welcomes guests with a restaurant and an outdoor pool. The King Room was very comfortable, comfy pillows, daily room cleaning and soothing warm water to bath with. The cocktails were okay and so was the atmosphere. I loved the beach setting for the bar area. Hotel Babylon in Paramaribo has 3-star accommodation with an outdoor swimming pool and a terrace. 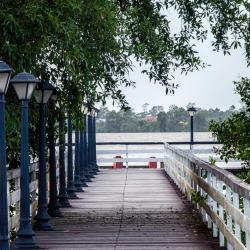 Offering an outdoor pool, fitness centre and restaurant, Hotel Krasnapolsky is located 500 metres from the River Suriname and 2 minutes’ drive from Paramaribo Central Market. Offering an outdoor pool and a restaurant, The Golden Truly Hotel & Casino is located in Paramaribo. It’s located just 4 km from the city centre and boasts a fully equipped casino. 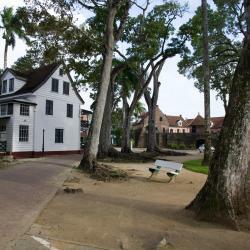 Located 500 metres from the historic centre and a 20-minute walk from the financial and commercial area, Eco Resort Inn features an outdoor swimming pool, a garden and a restaurant in Paramaribo. Comfortable room, staff were very helpful, breakfast was great. Queen’s Hotel is located in Paramaribo’s main entertainment district, just 200 metres from the Presidential Palace. It has its own nightclub, and rooms feature free internet access. The hotel is located at one of the main streets of Parbo. My family and I could walk around the town and we got to see the main spots without taking a cab. Besides, lots of restaurants are located nearby the hotel. The breakfast was good. The room was big, comfortable, and mostly important, it was a 4-person bedroom, fitting all of us. The staff was amazingly kind and helped us with everything. 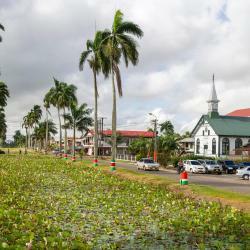 Maretraite Hotel is offering accommodation in Paramaribo. 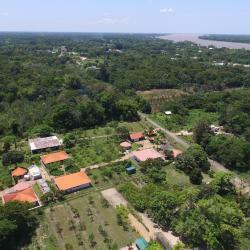 The property is situated 3.9 km from Paramaribo Central Market and 3.5 km from Waterkant. St. Petrus en Paulus kathedraal is 3.8 km away. 600 metres from Paramaribo Central Market, Midnight Hotel is set in Paramaribo and provides air-conditioned rooms. Boasting a 24-hour front desk, this property also provides guests with a restaurant. Boutique Hotel Peperpot is situated in Meerzorg. With an outdoor swimming pool, the property also has a fitness centre, as well as a garden. Free WiFi is available.